HoRNet's SW34EQ: a little slice of a console in your DAW. Described as "an equalizer coming straight from the '80s," HoRNet's SW34EQ is a digital emulation of an EQ unit found in an "American console". We'll leave you to work out which console might be being referred to; this is a traditional-looking EQ that promises a smooth and gentle sound and is said to be perfect for general tone-shaping. 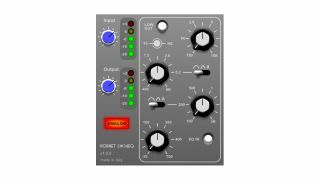 SW34EQ is available now for Mac and PC from the HoRNet website. It costs €17.99.